Please note this list is not inclusive and other symptoms may also be appropriate. 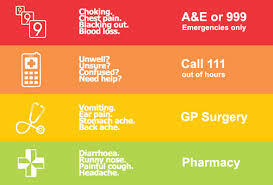 If you are not certain, quickly assess the situation and contact an emergency ambulance if appropriate. If you would like to speak to someone out of surgery hours in regards to any matter that is concerning you or require medical assistance, you can also dial 111 – this service is available 24/7 and can advise you on the services available out of hours such as walk in centres, late night chemists and, if required, out of hour GP services including home visits. All calls to the surgery out of hours are diverted to 111 who will connect you to the most appropriate service to deal with your problem. The Out of Hours GP service can also be contacted through this number.